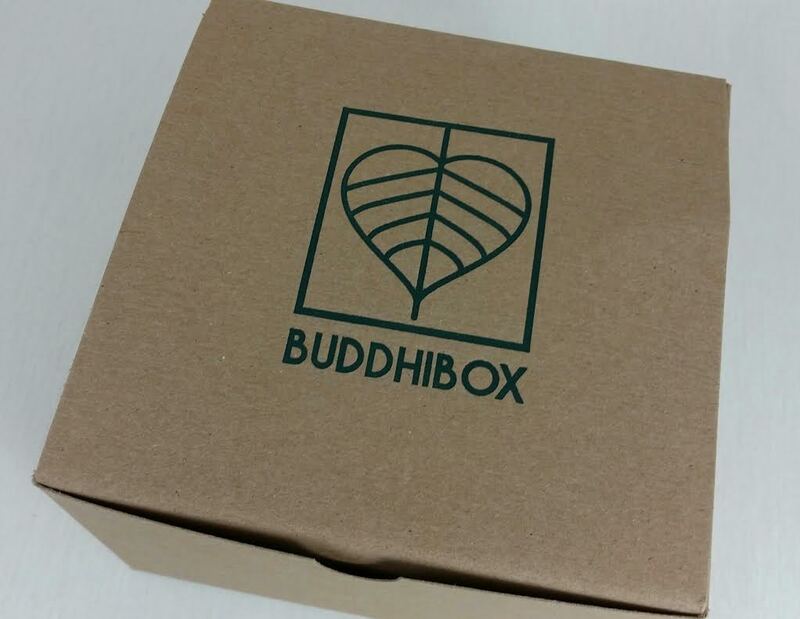 Every month Buddhibox chooses a charity to donate a portion of the monthly sales. This month it's the Circuelle Foundation. The Circuelle Foundation is a non-profit organization that focuses on reaching young women to help provide breast health education. Optimal Health Oil Thieves Blend- Apparently this is a recreation of the essential oils used by thieves robbing the dead to protect them from the Black Plague. It's a blend of cinnamon, clove, eucalyptus, rosemary and lemon and is supposed to kill 99.96% of airborne bacteria. The suggested use is to dab it on the bottom of your feet or diffuse it in your home among other things. Since there is cinnamon oil in this, do be careful if you are applying it to your skin as it is a known skin irritant. I think I might pour it into my diffuser. It smells sort of medicinal but fresh at the same time. Jiva Clothing Sweat Wicking Headband- I think I have a weird head or something because these kinds of things are always popping off. You can wear it thin or unfold it and wear it wide. It's pretty cute. 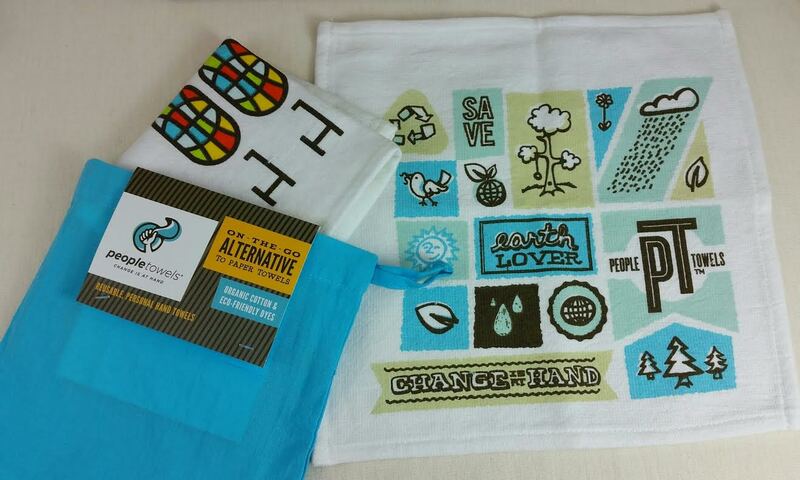 People Towels Towel Set with Eco Sack- I love these! 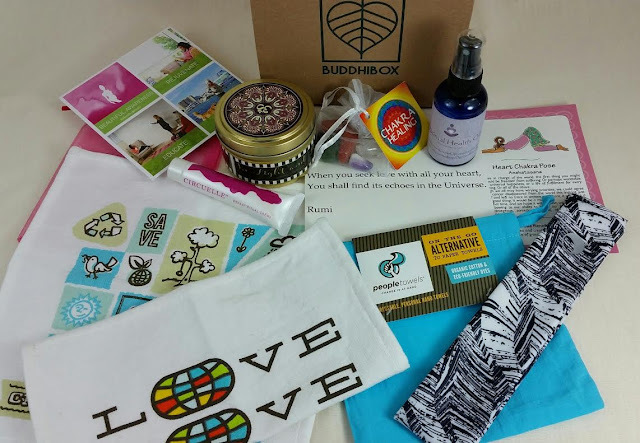 They're made from 100% certified organic cotton and are certified fair trade, as well. Use these instead of paper napkins and save a tree. These are SO cute, too. Now I have reusable sandwich bags and reusable paper towels! 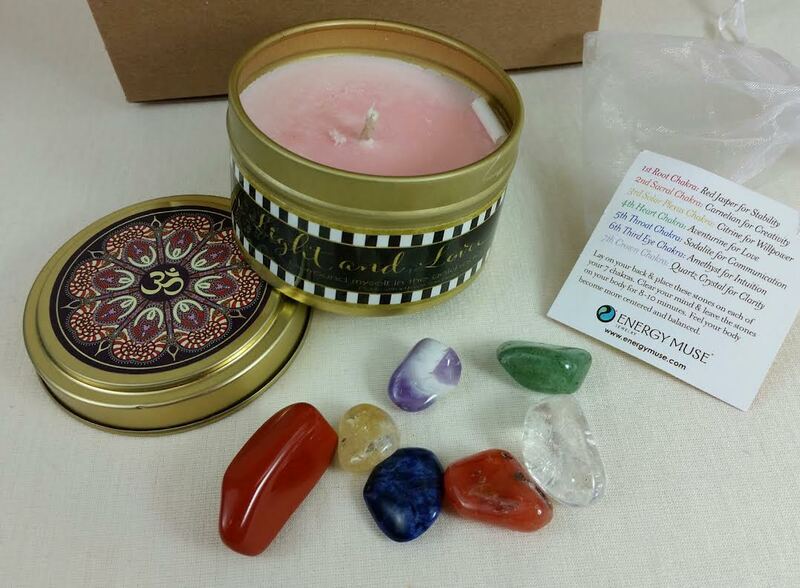 In Light + Love Candles Intention Candle- "Become present with your intention and write it on the candle. Then put it out to the universe and trust." This is a super sweet candle with a blend of vanilla, coconut, magnolia and lavender. It comes with a little piece of chalk to write with, too. I love the packaging! Energy Muse Chakra Healing Bag- This is a bag of polished stones to "help align, balance and cleanse your seven chakras." Well, I don't know enough about yoga to know what chakras are but this bag has red jasper, carnelian, citrine, aventurine, sodalite, amethyst and quartz. 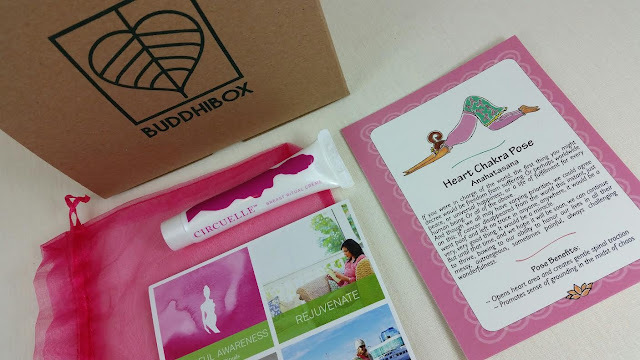 Bonus: Circuelle Foundation Breast Ritual Creme- In a nod to Breast Cancer Awareness month, the box this October has a bonus tube of cream made with green tea, vitamins D and E and evening primrose oil. It's lotion to make checking your breasts easier. Now get to that self-check! Every box also has an inspirational quote, a Pose flashcard and a recipe. My stack of Pose cards is getting pretty big and even though I don't practice yoga, it's still fun to pull out a card and try to wrangle my body into the pose I picked out. VERDICT: I really love the creativity in the curation of Buddhibox. If you practice yoga, you'll find a lot of meaning in the inclusions as well. Everything included is designed to encourage and enhance your yoga lifestyle both practically and mentally. The value is always there, as well. 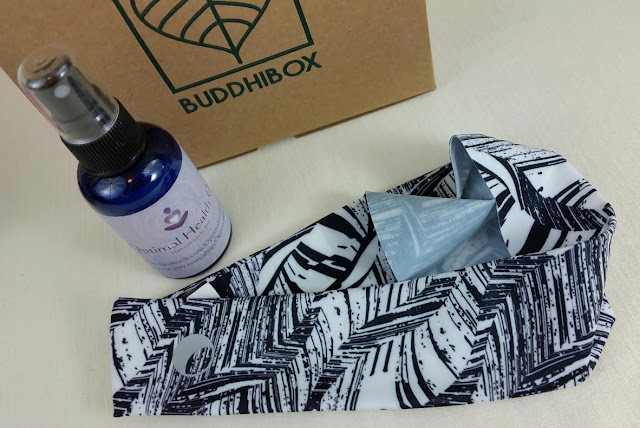 Plus it's a fun subscription because you really won't find the products inside anywhere else. It's always a little adventure for me to open because of that. It could be anything inside!